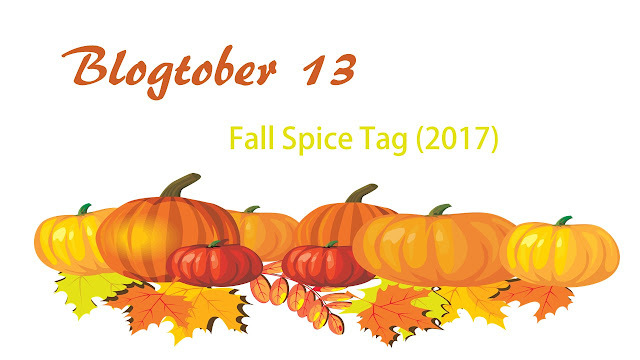 Today's Blogtober is the Fall Spice Tag I hope you enjoy and feel free to complete that tag in the comments below. 1. BB&W or Yankee Candles ? - I would have to say Yankee Candles the scent last longer to me and smells amazing especially the pumpkin spice. 2. Favorite fall accessory ? - Big chunky scarfs , I think they really tie together a fall outfit. 3. Uggs or moccasins ? -I never had Uggs , so I am going to go with moccasins they are so comfortable and easy to slip on. 4.Fuzzy socks of knee high socks ? -I love my fuzzy socks. 5. North Face of Columbia jackets ? 6. Favorite fall food ? 7.Red or pink lips ? - Red lips are classy and appropriate for fall. 8. Winged eyeliner or bright eyeshadow? - I love the winged eye-liner look . - I love natural looking makeup. 10. Apple pie or Brownies ? - I love apple pie during fall and brownies during the winter time. 11. Would you rather cook the food or eat the food ? I hope you enjoy the Fall Spice Tag 2017, comment your answer below .